Adam Gerber, and Patrick Noonan in Shear Madness. Photo by Carol Rosegg. BOTTOM LINE: For those who love the movie Clue, and find Sleep No More too sweaty with the masks. I have a confession to make—this was not my first time seeing Shear Madness (perhaps not surprising, since it's billed as "America's longest-running comedy"). I first saw it with my father when I was 13, and had never seen anything quite like its mix of audience participation, Borscht-belt humor, and topical up-to-the-minute references. So when I had the opportunity to revisit the show, this time in its New York premiere, I jumped at the chance—and of course took my own my son with me. Shear Madness is based on the 1963 German play Scherenschnitt by writer/psychologist Paul Pörtner. The basic premise of the original is maintained here, and involves a unisex hair salon (called “Shear Madness,” and aptly designed by Will Cotton) with six archetypal characters trying to solve a murder in which one of them is the killer. However, Shear Madness adds a seventh major character: the audience. After being introduced to the characters (two hairdressers, a wealthy client, a mysterious antiques dealer, and two cops) and witnessing their comings and goings, the houselights are then brought up and we are asked to participate in figuring out whodunit. And this is where the true fun of the performance lies. Did you remember which door the antiques dealer entered from? What did the female hairdresser throw in the trashcan? Who was the wealthy client speaking to on the telephone? The detective, played by the engaging and warm Patrick Noonan (a veteran of many previous productions of the show), wants you to help him out and correct the characters when they “misremember” what really occurred. Yell out. It’s OK. Have a question for one of the characters? Go ahead. Ask ‘em. And at the end, the true killer is decided based on who gets the most votes at that performance. Full disclaimer: I hate audience participation. It makes me nervous and embarrassed for everyone involved, especially me. But the performers in Shear Madness are so likable—even when throwing shade at audience members that attempt to accuse them—that never once did my palms start their usual participatory sweat. Much of this is due to Noonan, who acts as our moderator and keeps everything running smoothly, even when some more boisterous audience members attempt to hijack the proceedings. The rest of the company, including another Shear Madness vet Jordan Ahnquist as the very gay shop owner, Kate Middleton as his appropriately sleazy and lovable coworker, Adam Gerber as a hapless client/undercover cop, and Broadway vets Jeremy Kushnier and Lynne Wintersteller as two other fittingly shady customer-suspects, are all at the top of their game and ready at a moment’s notice to improvise a quip and try to throw the audience, and each other, off-track. The show is not high art, but of course that's not its aim. The jokes are cheesy and the characters border on the offensively stereotypical—a gay hairdresser? really?—but, amazingly enough, if you know that this is what you’re in for, it works. (Clearly, since it has been running since 1980 both around the country and the world.) So, sitting beside my 9-year-old son who belly laughed throughout (and thankfully missed many of the show’s double-entendres), and in front of the very enthusiastically involved 80-year-old "Golden Girls" (so-termed by Ahnquist after they buoyantly called him out for one of his moments of "misremembering" his actions), I couldn’t help but smile and enjoy being part of a show that is simply a really good time, because don’t we need those once in a while? Shear Madness is based on the play by Paul Pörtner, created by Marilyn Abrams and Bruce Jordan, and directed by Bruce Jordan. Scenic & Lighting Design is by Will Cotton. Costume Coordination is by Rodney Harper. Sound Design is by Bruce Landon Yauger. Production Stage Management is by Danny Maly. Production Supervision is by Tinc Productions. 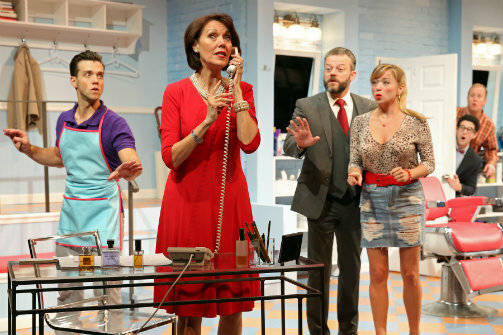 The cast is Jordan Ahnquist, Adam Gerber, Jeremy Kushnier, Kate Middleton, Patrick Noonan and Lynne Wintersteller.